Sharing what I wore on the weekend! This outfit was one I had in mind for our anniversary dinner on Friday. Unfortunately, the thongs (flip flops) kind of make the whole look a little too casual for eating out at a restaurant, and were against the dress code of the place we booked. My swollen pregnancy feet won't let me wear anything else though, haha! I really wanted to wear this pretty dress, so wore it on Saturday instead. We had a quiet day, and had dinner with the in-laws in the evening. My sister in law just got back from an amazing trip, so we had the chance to catch up and see some photos. Last worn: Jeanswest paisley print dress, gold glitter belt, Cotton On thongs, Rebecca Minkoff Swing bag. Simple maxi dress today, for lunch and a movie with DH. We are wondering how many more quiet weekends to ourselves we will get before baby arrives. Hopefully not too many more, we are so excited to meet the little one :) The checkout guy at Woolies was full of questions for us when we did the groceries, wondering when baby is due to arrive. We've seen him a few times during the pregnancy, he's always so sweet and asks how things are going. Was nice to just wear a dress today - although when we were walking Cooper in the evening I did find myself wishing I'd worn a jacket. First day of winter today so it will definitely start cooling off now, will soon have to start wearing more layers. Last worn: Jeanswest grey maxi dress, Havaianas, Rebecca Minkoff swing bag (see above). Linking up with Monday Must-Haves, #FunDayMonday, Mix It Monday, Manic Monday today. aww :( Hopefully you can rug up in some lovely layers to make it a little more bearable! It is about time for him to get here...how exciting! I love both dresses...the first one is really pretty. And it's great how most of the things you've worn during your pregnancy can work when the bump is gone too. aww you look so adorable! I 'm loving the yellow bag and I'm glad you got to enjoy a nice calm movie with him! hehe, your going to be such a good mother!! Love that tie dye maxi! Glad you took advantage of some relaxing time at home with your hubby! That yellow bag is really adorable, such a nice find:) I love the way you look in maxi dress, and the first one is also very pretty;))) Lovely snapshots as well! Happy five year anniversary!! Perfect timing for the little ninja who is about to arrive and meet everyone for the first time! So exciting!!! Not long to go! You can tell! Looking great and beautiful dresses! Aww bummer you couldn't wear that dress to dinner. Even with flip flops it's so pretty! Happy anniversary! these dresses look amazing on you!! i especially love the print of the first one! and happy anniversary! It actually feels like you've been pregnant forever! Haha but still looking stylish as ever! Happy Anniversary and what a bummer about the dinner. My feet grew about 1/2 size when I was preggos and it never went back down. I like these dresses. Especially the second one. Wearing that dress you look elegant and chic in a special way:) Well chosen accessories! Those Jeanswest Dresses are nice especially the Paisley one. 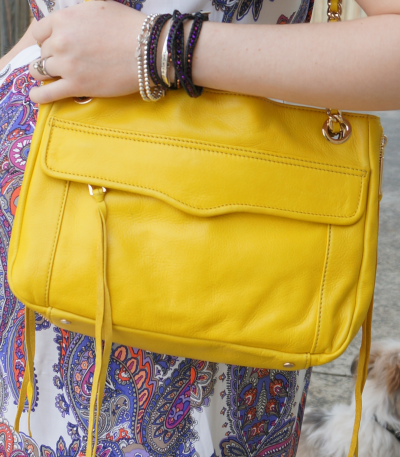 I also adore the yellow bag. =) Too bad about the restaurant giving you attitude. I didn't experience bigger feet while pregnant, thankfully. Always love when you stop by. Thanks for your latest nice comment and enjoy this new week and month. <3 Ada. Oh, they didn't have a problem with it, I wore the maxi dress (previous post) to dinner so I could sneak my footwear in under the radar, haha. I'm not sure what they would have done if I'd turned up in the dress above, so I wore a maxi dress (previous post) to hide my footwear choices haha! Don't forget to check my Shopbop gift card giveaway! You look so special with baby belly and you ddidn't get so many kilos during pregnancy!.You rock your dresses and Havayianas are not just flip flops! Best wishes for the big day! Hi! Happy anniversary! 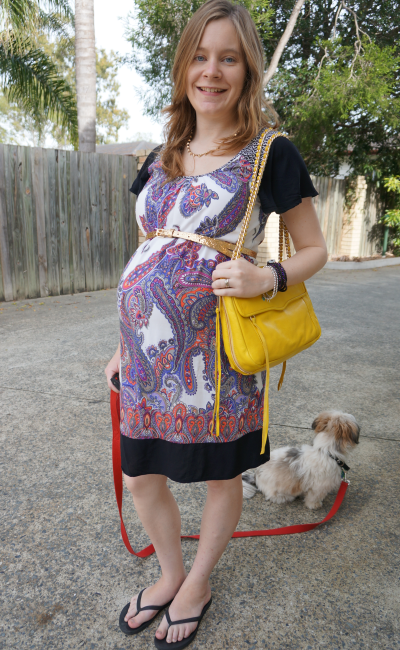 Nice ideas for outfits when you're expecting. You look adorable! Wow that is strict policy considering you had a long dress on. Love the bag I have so been wanting to get on of those. it's a pretty common policy around here :) Even at beachside places! 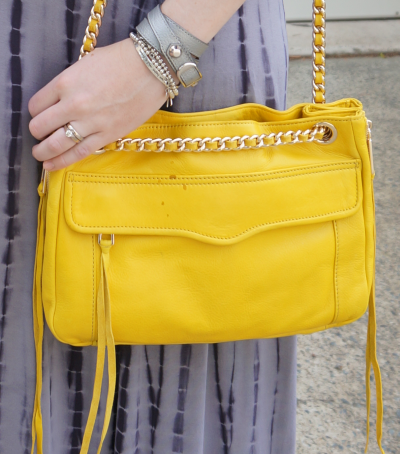 I love your tie dye maxi dress, and grey and mustard is one of my favorite combos! I REALLY like the tie-dye dress! Too cute! And no--- I don't miss swollen pregnancy feet! I keep thinking that I am going to visit your blog and you'll have had the baby… it's coming up! Yes, not long to go now! Both are so cute on you Mica! Love that maxi dress especially. You always look so beautiful! I think anyplace will give a pregnant girl a free card for the flip flops! and they did not take anything away from outfit, you still looked stunning! Thanks for sharing and happy anniversary! Thanks Milu! I wore a maxi dress out to dinner (previous post) just to be sure they couldn't see my feet so it wouldn't cause issues, haha! Both outfits are gorgeous but the second on is my favorite because purple looks amazing on u. By the way Happy Anniversary! Happy Anniversary! That was a shame, I still think it's dressy and beautiful! That restaurant wasn't good enough for you anyway...ha! Maybe it's a good idea for a post that you can schedule. love that you are making your non-maternity pieces work even in your latest months of pregnancy! both dresses are beautiful. can't believe you're going to be a momma soon!! I'm loving that yellow bag!! It goes perfectly with both of your adorable dresses here! Both dresses are fabulous on you! hey lovely, SURELY they let you in despite the dress code! they must not have had swollen pregnancy feet before! especially loving the colour combo of the second outfit here.. hope you're having a good break! Oh I wore a maxi dress to dinner (previous post) so they let me in....as they couldn't see my feet haha. Didn't want to risk it by having the thongs out there in the open, so the maxi dress was a better choice. Sorry I'm so late getting to read this! :( Dang I'm so behind on life right now!! Oh hope the swelling goes down soon for you!